Design: Hiroshi Nakamura & NAP Co., Ltd. The project was designed for rental apartments in the heart of Tokyo. The site is in a deep L- shape with slopes at the rear, and due to this character there are given legal constraints on the maximum number of residences in the area. We resisted the option of removing existing trees in order to increase floor area. Six apartments were finally created for the cohabitation for people and woods. A symbiotic life between men and nature was suggested. On the precondition of the conservation of trees, we have to maximizing built area. Advice has been taken from “tree doctors” on the location of the trees roots. The position of the structures was carefully decided based on this information. At places that are needed, the foundation would have to be bent into a snake shape in order to preserve the trees’ roots. Three-dimensional analyses were given to trees with diameter over 15 inches by a specifically developed computer programme. The programme can also simulate the growth pattern and behaviour of the trees in typhoon conditions. As the form of the building was generated by the pattern of nature, a certain clam and mild feeling was evolved as a result of the design. Reinforced concrete insulation was provided for the living, dining and kitchen spaces of the apartments. Direct interaction with nature can be found in all rooms. The steel skeletons of the libraries and the bathrooms are extent into the woods. Bookshelves, desks, bathtubs and desks are placed next to the windows; they become mediums for an integration of personal life with the trees outside. This kind of life style became the concept for this project. 2003: Established First Class Architect Office Hiroshi Nakamura & NAP Associates Inc. 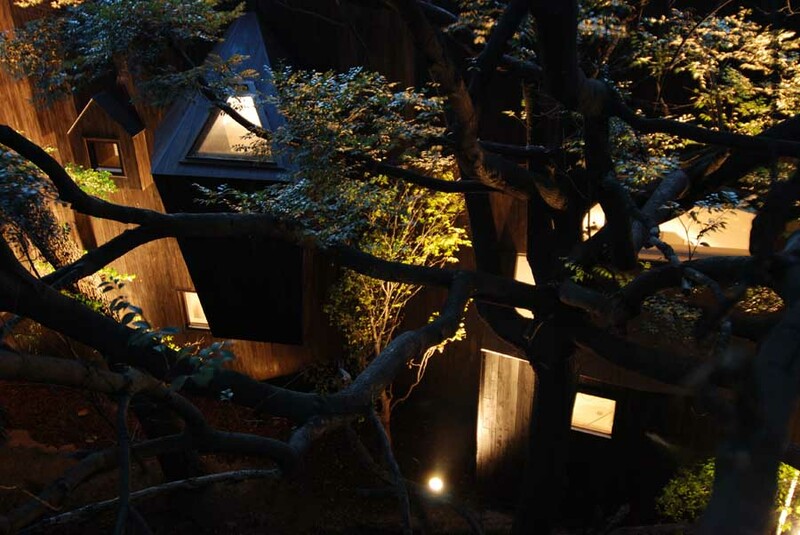 Dancing trees, Singing birds, Tokyo images / information from Hiroshi Nakamura & NAP Co., Ltd.